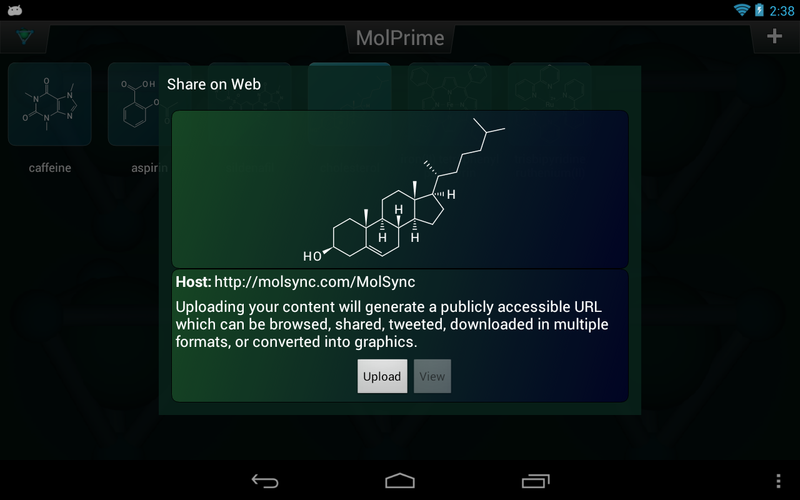 The most recent version version of MolPrime for Android v1.0.3 adds the ability to share structures on the open web. 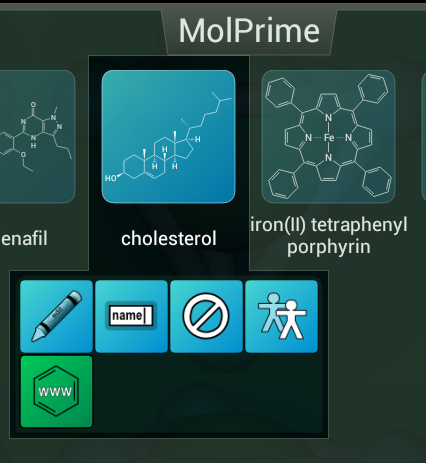 The Android port of MolPrime was originally released as a technology proof of concept, a work in progress to show that the core functionality of chemical structure drawing has been successfully ported to the other popular mobile platform. Now with the ability to share structures, the free app now starts to take on the role of a useful workflow productivity tool. The text explains that once you’ve uploaded the structure, it becomes openly accessible by anyone who has the URL to access it. Uploading is anonymous, i.e. the server doesn’t care who you are, and does not attempt to identify you in any way, but your data does become part of the open internet. As an alternative to looking at the screenshot above, you can view the actual page at: http://molsync.com/share/?mol=2280. The service is hosted by molsync.com (see previous blogs), which serves up the view page dynamically based on the raw cheminformatic data that it stores in its database. The picture of cholesterol displayed in the page is actually rendered using browser-generated vector graphics, which you’ll notice if you zoom in on the page (using Ctrl-+). There is a row of sharing icons along the top, including the popular social networks, like Twitter, Facebook, LinkedIn and Google+. The dynamic web page also asks the server to calculate a few properties, which are displayed underneath the structure. 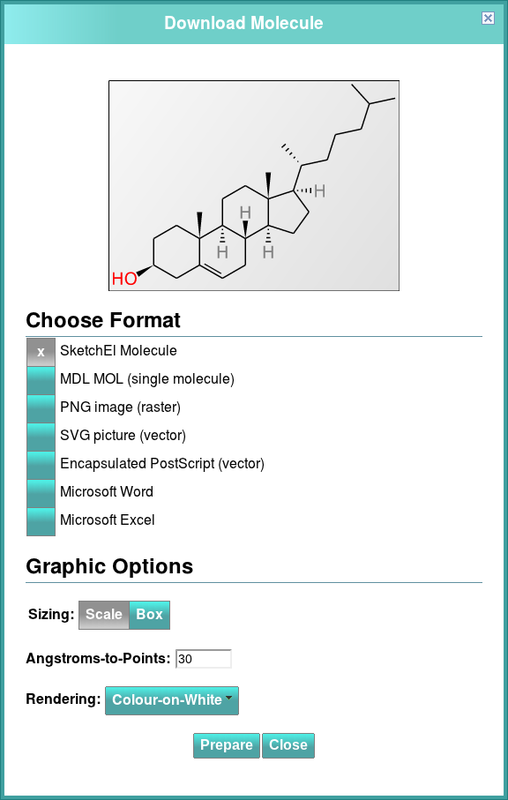 Because the server has the raw structure representation on hand, and a comprehensive cheminformatics stack, it can offer to do things… like converting it to other cheminformatics formats, and rendering it as various types of graphics, including PNG (bitmap, at custom-specified resolution), SVG (scalable vector graphics), EPS (encapsulated postscript), as well as Microsoft Word or Excel documents which, in the case of molecules, contain just a single embedded vector graphics diagram that can be used within Microsoft Office. 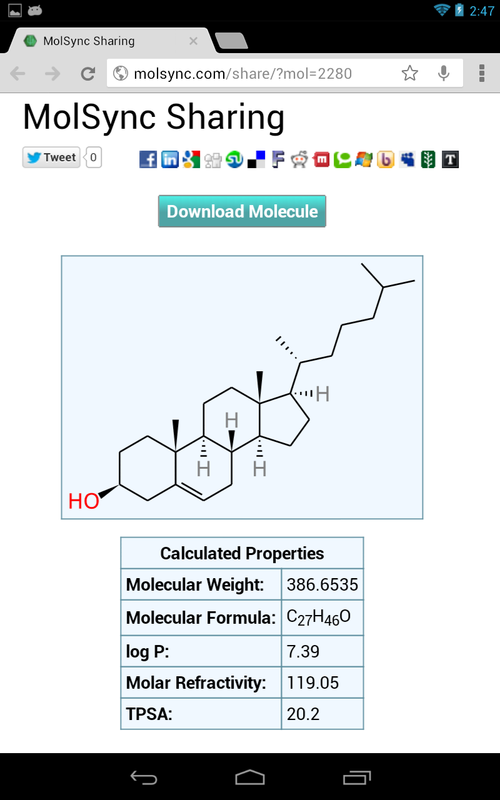 MolPrime 1.0.3 has a long way to go to catch up with the functionality of related iOS-based apps like the Mobile Molecular DataSheet, but one step at a time the Android equivalent features are taking shape.